A good face wash is a necessity, but it can also be hard to find. Therefore, when a company claim that a face wash is "one killer cleanser", it deserves some interest! 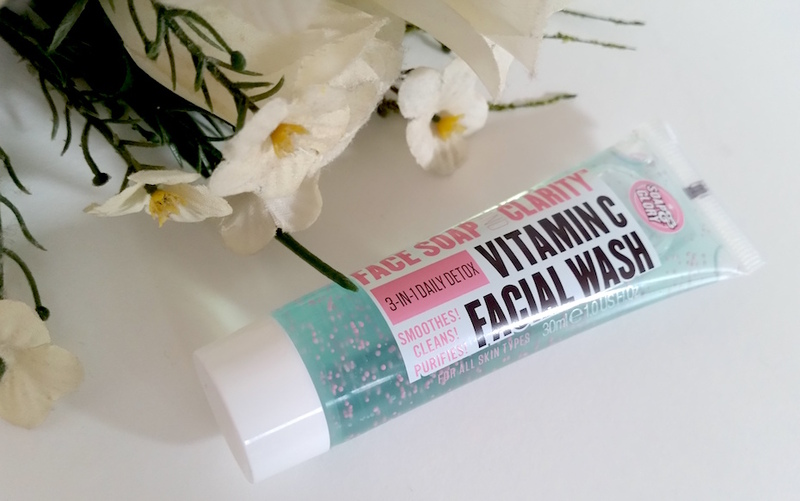 The Soap & Glory Face Soap & Clarity 3-in-1 Daily Detox Vitamin C Face Wash (bit of a mouthful!) is described as exactly that. It contains Superfruit Yuzu complex, an exclusive to Soap & Glory that energises, brightens and tones the skin with its antioxidant rich formula that is pressed from Chinese citrus fruits. In addition, it also contains super-soft scrub beads to exfoliate, amino acids and vitamins to improve the appearance of blemishes as well as to improve the skins' radiance, and glycerin, which helps to soften the skin. If that wasn't enough, this face wash is also said to be rinsed easily and it is free of drying surfactants. I currently have a small, 30ml tube of the wash, but the full-size comes packaged in a large, plastic bottle that holds 350ml of product. The wash itself is a bright, translucent blue gel and the scrub beads are pink. It also has the typical Soap and Glory scent to it (yum!). Wet the face and apply a grape sized amount to your fingers and gently massage into the skin. Rinse thoroughly and pat dry. Firstly, I have to say that I find the "grape sized amount" that Soap & Glory suggest to be a tad excessive. I tend to use about half a grape sized amount, maybe a tiny bit less, and it is more than enough to cover the face and wash it well. Just like the claim, this face wash rinses easily, so there is minimal messing around when trying to remove it from your skin. Once dry, you can instantly see the effects. Not only does the skin feel clean, but it really looks it. Even from the first wash. Face Soap and Clarity is a perfectly fitting name! In addition to clean, this wash is softening. It isn't the most softening face wash that I have ever tried, but it is good and ideal for all skin types, even oily! For reference, my skin is oily and I have no issues with this wash. My skin is also prone to break outs with certain products, but again, not with this. Full ingredients can be found here. Overall, I was really pleased with the results of this face wash. It really does what it sets out to do and is great for every day use. I find that it works as well, if not better, than a lot of face washes at least twice the price of it. If you can't justify spending a huge amount on your skincare but you are looking for results, I definitely recommend checking this face wash out. You can purchase Soap & Glory's Face Soap & Clarity 3-in-1 Daily Detox Vitamin C Face Wash for £8/350ml from Boots. 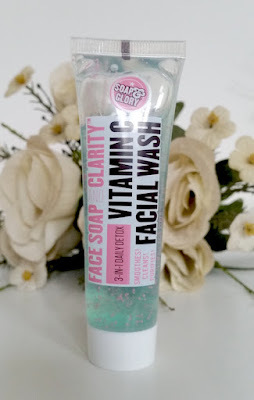 What are your thoughts on Soap & Glory's Face Soap & Clarity 3-in-1 Daily Detox Vitamin C Face Wash? What is your favourite face wash?